Everyone’s cult-favorite television series Twin Peaks is no stranger to fashion collaborations. Whether it’s adorable enamel pins, a character-inspired wardrobe or Balenciaga’s S/S 2017 collection, Twin Peaks continues to endlessly influence our style. Now, director David Lynch has collaborated with Habitat to bring us a collection we never knew we wanted until now—a line of Twin Peaks skateboards. 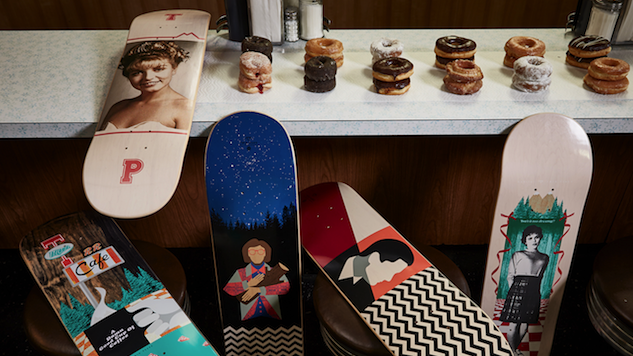 The clever promo photos show the silhouettes of fan-favorites Audrey Horn, Special Agent Dale Cooper and Log Lady enjoying cups of coffee at the Double R Diner, while also showing off their rad shred sleds. Are they about to ollie their way to the Black Lodge, or simply flaunting their killer aesthetic? Either way, we’re into it. Check out the photos in the gallery, along with some bonus photos of Habitat’s Twin Peaks mugs, T-shirts and buttons that were just too good to leave out. Twin Peaks returns to Showtime on May 21, and we’re counting the days.